If you have suffered an on-the-job injury, you need to file an Oregon Workers Compensation claim. If you have suffered an on-the-job injury, you need to file a claim immediately. The longer you wait to file the claim, the more likely it is that the claim will be denied, particularly if you get hurt Friday and don’t report the injury until after the weekend. You can complete an 801 form provided by your employer; you can fill out an incident report and give it to your employer; you can fill out a Form 827 at your medical provider’s office; or you can write out what happened to you and give it to your employer. Generally, you must report the injury in writing within 90 days, but there are exceptions that will allow you to file within one year of the accident. When you file your claim, be sure to identify all of the areas of your body that are involved. You never know which parts will quickly resolve and which will linger and become bigger problems. 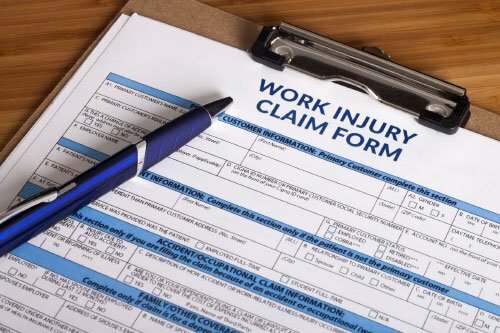 Even if you mentioned your injury to a co-worker or a supervisor, to be eligible for Workers Compensation benefits, you must fill out an 801 claim form and give it either to your employer or your Workers Compensation insurer. You only have 90 days from your date of injury to file a claim. Although you have 90 days to file a valid claim, the longer you wait to file a claim, the more likely it is that the insurer will deny that claim. You need to be as accurate and as honest as possible in describing your on-the-job injury when filling out the claim form. Once the Workers Compensation insurer has received your 801 form, it has 60 days to either accept or deny your claim. If your physician has removed you from work due to your injury, in most situations you are entitled to temporary disability benefits while the insurer is investigating and making its decision about your claim. The insurer will likely take your statement as part of its claim investigation process. You need to cooperate with the insurer’s investigation. Although you will not be under oath when answering insurer questions, you need to answer these questions truthfully. When the insurer asks you about prior injuries, stop and think hard about any potential previous injuries. Your credibility is extremely important and even an unintentional false statement will come back to haunt you. If you have decided to hire an attorney, you need to tell the insurance company before they take your statement, because you have the right to have your attorney present during the time that your statement is taken. An experienced workers’ compensation attorney can advise you about your particular facts to make sure that you give an appropriate statement and that you cover everything that needs to be covered. It is critical that you seek medical treatment immediately after your on-the-job injury. It is also critical that you tell your medical provider about all of your symptoms – not just the most acute or painful symptoms. Should you need to challenge an insurer’s decision about your claim, often the most important evidence for either you or the insurer is found in medical records created during the early stages of your claim. In order for a claimed condition to be found work related, you must have disability or require medical care. If the insurer accepts your claim, the insurer will send you a Notice of Acceptance. That Notice will list what condition the insurer agrees are work related and will indicate whether the insurer considers your claim to be ‘non-disabling’ or ‘disabling.’ Please see the workers compensation frequently asked questions for the difference between a ‘non-disabling’ and ‘disabling’ claim. If you disagree with the condition(s) accepted or the claim classification, you have a short timeline in which to request that the insurer correct its Notice of Acceptance. Once your claim is accepted, the insurer is responsible for all medical treatment related to the accepted condition. The insurer must also pay you temporary disability benefits as long as your physician determines that your on-the-job injury keeps you from performing your regular job duties. If your physician has taken you off of work and you are not receiving compensation equal to 2/3 of your average weekly wage every two weeks, you need to contact an oregon workers compensation attorney immediately. If you have questions about your Notice of Acceptance or about benefits you are currently receiving, call Moore and Jensen. Our experienced attorneys and staff can help you understand your Notice of Acceptance and explain what benefits you should now be entitled to. If the insurer denies your claim, it will send you a Notice of Denial. You have 60 days from the date of the denial to request a hearing challenging that denial. If you have a denied Workers Compensation claim, it is imperative that you contact our Oregon law firm for help challenging that denial because Oregon Workers Compensation law is complicated and ever-changing. At Moore and Jensen, we begin our challenge of the insurer’s denial by requesting a hearing and obtaining your claim file from the workers compensation insurer. We then work with you and your physician(s) to establish the legal and medical evidence necessary to prove to an administrative law judge that the insurer’s denial was wrong and that you should be entitled to workers compensation benefits. For Oregon attorneys, workers compensation is a contingent fee practice. This means that your attorney does not get paid unless he or she gets you benefits that you would not be able to get on your own. If your attorney successfully challenges an insurer’s denial, the insurer is then required to pay your attorney a fee. If your attorney successfully gets you an increase in your bi-weekly amount of disability benefits, the insurer will be required to pay your attorney a fee and and if the insurer acted unreasonably, they will be required to pay you a penalty based on the amount of compensationthat was unpaid or late paid. If the attorney successfully gets you an increase in your time loss (wage replacement) the insurer will be required to pay the attorney fee in addition to that increase in time loss that you get. If the insurer acted unreasonably, they will be required to pay you a penalty and also pay your attorney an additional attorney fee. If your attorney successfully challenges your Notice of Closure, and gets you additional permanent disability award money, your attorney will receive a percentage of any increase in your disability award..
Should you choose to buy out of your Oregon Workers Compensation claim through a settlement, your attorney will receive 25 percent of your settlement proceeds of the first $50,000 and 10 percent of anything above $50,000. For example, if your workers’ compensation claim settles for $60,000, then your attorney would get $12,500 of the first $50,000, and $1,000 out of the remaining $10,000. *Note on the Oregon Workers’ Compensation claims section: I would like to set “settlement” to return that all the way to the end, rather than have that be the first thing.